Aren’t food labels supposed to be easy to read, made with simplicity to tell you what you’re really consuming? Unfortunately, no. It has been shown that 9 of 10 parents are misled by food labels, and those statistics likely haven’t dropped. Although reading food labels can be a chore at first, it is possible to break down food labels and understand them with some guidance. Another very simple, although not bulletproof way of knowing which ingredients to avoid when reading food labels is to apply a simple test of pronunciation – if you can’t say it, reconsider the purchase. Additionally, look for products with only a few ingredients over products with a long list of ingredients. Ingredients listed on food labels are organized based on the amount of each ingredient in the product in relationship to how much of every other ingredient is present. However, companies often deceive consumers by creating ‘formulas’ or ‘blends’ of two or more ingredients in order to manipulate a specific ingredient(s) placement on the food label without breaking any rules. Fat Free – Less than 0.5g of fat per serving. Low Fat – Contains 3g or less of fat per serving. Reduced or Less Fat – Product has at least 25% less fat per serving than the original reference food. Saturated Fat Free – The product contains less than 0.5g of saturated fat per serving and the level of trans fatty acids is no more than 1% of the total fat. Reduced or Less Saturated Fat – Has at least 25% less saturated fat per serving than the original reference food. 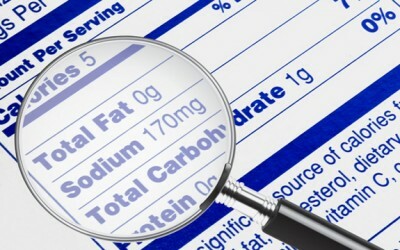 Low Saturated Fat – 1g or less per serving and not more than 15% of the total calories are from saturated fat. Sugar Free – The product has less than 0.5g of sugar per serving. No Sugar Added – Products that had no sugar added during processing or packing. The food or drink may already naturally contain sugar. It may still contain sweeteners. Reduced Sugar – The product has at least 25% less sugar per serving than the reference product. Calorie Free – The product contains less than 5 calories per serving. Low Calorie – The product contains 40 calories or less per serving. Reduced Calorie – There are at least one-third fewer calories than that of the reference product. Cholesterol Free – The product contains less than 2 mg of cholesterol and 2g or less saturated fat per serving. Low Cholesterol – The product has 20mg or less of cholesterol and 2g or less of saturated fat per serving. Reduced or Less Cholesterol – Indicates a product has at least 25% less and 2g or less of saturated fat per serving than that of the reference product. High Fiber – The product contains 5 or more grams of fiber per serving. High fiber claims must also meet the criteria for low fat or the level of total fat must be shown next to the high fiber claim. Good Source Of Fiber – The product contains 2.5 to 4.9g of fiber per serving. More Added Fiber – The product contains 2.5g of fiber or more per serving than the original reference food. Sodium Free – The product contains less than 5mg of sodium per serving. Low Sodium – The product has 140mg or less of sodium per serving. Very Low Sodium – An item with 35mg or less of sodium per serving. Reduced or Less Sodium – Requires that the product be at least 25% less per serving than the reference product. Lean – Packaged meat, poultry or seafood with less than 10 grams of total fat, less than 4 grams of saturated fat and less than 95 milligrams of cholesterol per 100 grams. Extra Lean – Packaged meat, poultry or seafood with less than 5 grams of fat, 2 grams saturated fat and 95 mg of cholesterol. Good Source of ___ – The product contains 10 – 19% of the listed ingredient’s Daily Value per serving. Rich in, High in or ‘and Excellent Source of’ ___ – The product contains 20% or more of the listed ingredient’s Daily Value per serving. Enriched or Fortified – The product contains 10% or more of the per serving Daily Value for protein, vitamins, minerals, dietary fiber or potassium than the reference product. Natural Flavorings – A wide range of flavorings that are derived from a spice, fruit, edible yeast, herb, bark, bud, root, leaf or similar plant material, meat, seafood, poultry, egg, dairy product, including hydrolyzed protein and hydrolyzed vegetable protein, both of which contain MSG. Note that the daily value (DV) percentages are not even close to what anyone really needs to achieve good health. In fact, the daily value’s percentages are based on minimal survivability. What you’re reading is, ‘you need this much of this in order to survive’. If you aimed for 100% daily values, optimal health will never be achieved. This is especially true since soil has degraded greatly over the years, resulting in less nutritionally-dense crops. With that being said, a very small amount of people actually consume the nutrients required according to the FDA’s standards anyway. Although reading food labels can be helpful, you likely need a high-quality whole-food based supplement to effectively enhance overall health. There are 3 types of organic products; 100% organic, organic, and made with organic ingredients. 100% Organic – Made with 100% organic ingredients. These are the highest quality organic products. Organic – Made with at least 95% organic ingredients. A close runner-up to the highest quality. Made with Organic Ingredients – Made with at least 70% organic ingredients. The remaining 30% adheres to strict restrictions and won’t contain GMO’s or additives. These products don’t quality for the USDA seal. In order to really find out if the food you are buying is genetically modified, conventional, or organic, look for the PLU code (the 4 or 5 digit code found on the product). Reading food labels won’t help you to find this information, so here is what to look for when you find the code. Don’t be fanatical when it comes to purchasing food. Although it is great to know what to buy and what to avoid, things could be worse if stress is being cultivated because of it. The easiets way to purchase healthy food is to shop at a local health food store or farmers’ market. Just do the best you can and practice reading food labels It will be like second nature soon enough. The problem is that few people bother to read that handy little label. It then gets funny when those very same people start complaining about how this and that food item made them fat and unhealthy. I see alot of fruit that don't start with a four it starts with a three what is tht?